The major susceptibility genes to T1DM are located mainly in HLA region. In addition to HLA, many genes, such as human insulin gene (INS), cytotoxic T-lymphocyte-associated protein 4 (CTLA4) and PTPN22, also contribute to the risk of T1DM. The mechanisms involved in the β-cell destruction in T1DM are complex. The main feature of this disease is lymphocytic infiltration or inflammation in pancreatic islets insulitis causes destruction of the insulin producing β-cells. The main defects in type 1 diabetes are presence of autoantigens and abnormalities in immune cells. This review outlines the molecular and immunological mechanisms mediate destruction of the pancreatic β-cells. Diabetes, Autoimmune diseases, Insulitis, β-cells, HLA, Autoantigens. One of the most widely c complex genetic disorders is type 1 diabetes (T1DM), which is typically caused by autoimmune destruction of β-cells in pancreas and results in insulin deficiency . The major susceptibility genes to T1DM are located mainly in HLA region. In addition to HLA, many genes, such as human insulin gene (INS), cytotoxic T-lymphocyte-associated protein 4 (CTLA4) and PTPN22, also contribute to the risk of T1DM .T1DM is characterized by a specific adaptive immunity against β-cell antigens. The mechanisms involved in the β-cell destruction in T1DM are complex and still not clear. However it is generally believed that β-cell auto antigens and immune cells are involved in this autoimmune disease. The main feature of this disease is lymphocytic infiltration or inflammation in pancreatic islets called “insulitis.” Insulitis causes destruction of the insulin producing β-cells, resulting in diabetes . This review outlines the molecular and immunological mechanisms mediate destruction of the pancreatic β-cells. HLA region on chromosome 6p21 is a critical susceptibility locus for many human autoimmune diseases, including T1DM (Figure 1) . There are two combinations of HLA genes are of particular importance; DR3-DQ2 and DR4-DQ8 . The genotype combining the 2 susceptibility DR4-DQ8and DR3-DQ2 is contributes the highest risk of T1DM and is most common in children . In addition, it has been estimated HLA region particularly HLA class II genes encoding DQB1 and DRB1 provides up to 40: 50% of the familial aggregation of T1DM . The mechanisms by which the HLA class II genes confer susceptibility to β-cells destruction are might through the binding of peptides derived from proinsulin, insulinoma- associated antigen 2 (IA-2), glutamic acid decarboxylase (GAD), and zinc transporter 8 (ZnT8) to antigen-presenting cells (APCs) . Furthermore, other loci in HLA region including alleles of class I HLA-B, MHC class I chain related gene A (MICA) and class III genes have been associated in T1DM susceptibility . 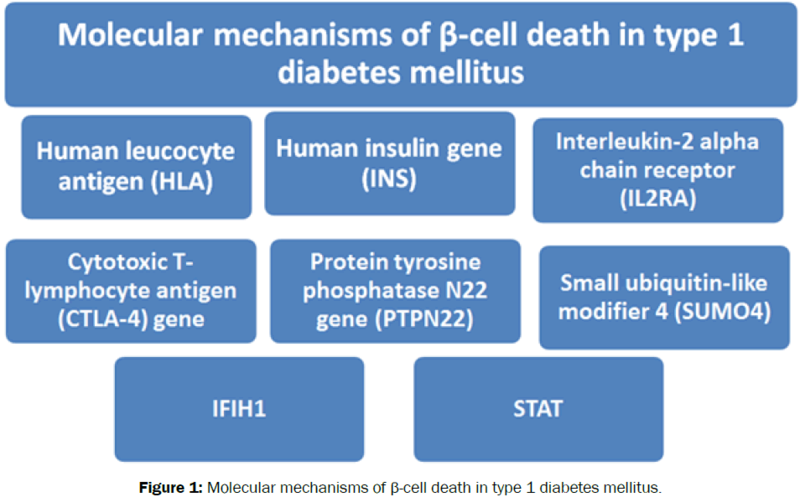 Figure 1: Molecular mechanisms of β-cell death in type 1 diabetes mellitus. The human insulin gene (INS) is located on chromosome 11p15.5, which consists of 3 exons and 2 introns . These exons are code for the signal peptide, the β-chain, C-peptide, and the α-chain of the insulin molecule . Not surprise that the mutations in the insulin region could contribute to T1DM susceptibility . The tandem repeats (VNTRs) in the INS gene are originated in three forms, class I, II and III alleles . There is a higher occurrence of class I alleles in individuals with T1DM, whereas protection from T1DM is associated with the class III allele . The mechanism of VNTRs in the INS gene affect the risk of T1DM is unknown. It has been shown that the VNTRs can regulate insulin messenger RNA (mRNA) transcription in the pancreas and thymus . Fur thermore, it has been established that class I alleles are associated with higher INS expression in the pancreas when compared with class III alleles, but the contrasting is true in the thymus where class I alleles are expressed at 2–3-fold lower levels . The CTLA-4 gene is located on chromosome 2q33 and encodes a co-stimulatory molecule that is expressed on the surface of activated T cells . The CTLA-4 molecule, together with CD28 (co-stimulatory molecule expressed on the surface of resting and activated T cells), plays an important role in the T-cell response to antigen presentation . Pervious study proved that, changes in expression of CTLA4 can increase T cell self-reactivity and may lead to develop T1DM . It has been proved the role of this molecule in susceptibility to T1DM . The protein tyrosine phosphatase N22 gene (PTPN22) encodes a lymphoid-specific phosphatase (LYP) which is considering an important down-regulator of T cell activation . LYP is mainly expressed in T cells and plays important role in inhibiting T cell receptor (TCR) signaling by dephosphorylation of three kinases in the TCR signaling pathway . In addition, LYP interacts with Cterminal Src tyrosine kinase (Csk) to down-regulate T cell activation . A PTPN22 polymorphism, C1858T, was found associated with T1DM in different Caucasian populations . It has been reported that the interleukin 2 receptor alpha (IL2RA) region on chromosome 10p15 was associated with T1DM . Form the three genes involved in IL-2 signaling, the IL2RA subunit was the first one to be found associated with T1DM . This gene codes for the α-subunit of the IL2 receptor, similarly known as CD25, and it is one of the markers that define regulatory T cells . CD25 is responsible for binding of IL-2 and plays a role in the proliferation of regulatory T cells. It has been established that, the mutations in CD25 may potentially lead to the development of autoimmunity . SUMO4 protein is encoded by the SUMO4 gene located at chromosome 6q25 . SUMO4 gene has been found to be involved in immune responses including autoimmunity and inflammation through NF-κB regulation and heat shock transcriptional factor activation . A common single nucleotide polymorphism encoding a methionine-to valine substitution at codon 55 (M55V) has been identified in SUMO4 gene . This substitution results a significant reduction of sumoylation capacity and higher NF- κB activity as well as elevated secretion of IL12B . The transcription factor NF-κB has a central regulatory role in the immune response and is involved in the development of autoimmune diabetes . Pervious study has found polymorphisms in signal transducers and activators of transcription STAT to be associated with T1DM . STAT4 is expressed in activated peripheral blood monocytes cells (PBMCs), dendritic cells (DCs), and macrophages at sites of inflammation . STAT4 is involved in the signaling of IL-12 and γIFN, as well as IL-23 and plays a key role in the IL-12-induced differentiation of T cells . STAT4 may also be involved in the production of IL-17 by Th17 cells, in response to IL-23 (Th17 pathway) . Unlike HLA class II genes, which strongly influence the risk for developing islet autoantibodies , association of the IFIH1 gene was limited to the progression to diabetes after development of islet autoimmunity . The IFIH1 gene encodes helicase C domain 1, which mediates stimulation of the interferon response to viral RNA . The association of IFIH1 polymorphisms including rare variants with T1DM has been notable because of their link to the inflammatory response caused by infectious agents, including enteroviruses . The main autoantigens are associated with β-cell components, including insulin, glutamic acid decarboxylase (GAD), islet cell antigen-2n (IA-2) and zinc transporter 8 (ZnT8) (Figure 2) [34,35]. Figure 2: Immunological mechanisms of β-cell death in type 1 diabetes mellitus. Insulin is the first antigenic target discovered during the early progression of diabetes . Autoantibodies to insulin are found in 50- 70% of type 1 diabetic children and are the first sign of an ongoing autoimmune process . Studies of multiple countries have reported that insulin autoantibody (IAA) play an important role in diabetes prediction . Previous study represented that, transgenic expression of mouse proinsulin II under a MHC class II gene inhibit the development of diabetes in non-obese diabetic (NOD) mice . In addition, other experiments have shown that mucosal administration of insulin prevents the onset of diabetes in the NOD model of diabetes [40,41]. These results suggest that insulin autoantigen plays an important role in the development of T1DM. The enzyme GAD plays important role in neurotransmission within the central nervous system which is also released in pancreas . GAD is present in two isoforms, GAD-65 and GAD-67, which are the products of two different genes and differ substantially only at their N-terminal regions . Previous study represented that sera from T1DM patients was found to precipitate a GAD . Only GAD-65 is expressed in the β-cells of human islets, the autoantibody response is primarily to this isoform, and GAD-67 antibodies add little to the detection of T1DM . The percentage of GAD-65 antibody is found in 70-75% of T1DM patients and 1-2% of healthy individuals . IA-2 and IA-2b have a high degree of homology and are located in secretory granules . IA-2 and IA-2b are members of the protein tyrosine phosphatase family and are considered to be major autoantigens of T1DM . Pervious study revealed that about 65% of diagnosed T1DM patients have autoantibodies to IA-2 and between 35% and 50% of type 1 diabetic patients have autoantibodies to IA-2b . ZnT8 is an islet β-cell secretory granule membrane protein recently identified as an autoantibody antigen in T1DM . It is highly β-cell specific unlike GAD and IA-2 . Pervious experiment represented that, ZnT8 was targeted by autoantibodies in 60– 80% of onset T1DM . Unlike GAD and IA2, ZnT8 is highly β-cell specific, thus ZnT8 antibodies measurements may be useful in monitoring islet destruction . IGRP is a putative enzyme that is specifically expressed in the islets of Langerhans, where it is localized predominantly in insulin-producing β-cells . IGRP) is recognized as a major autoantigen for autoimmune type 1 diabetes . The precise role of IGRP in human T1DM is unclear. The T1DM susceptibility locus IDDM7 was mapped within the IGRP locus, suggesting the possibility that IGRP is a disease susceptibility gene . Pdx1 is a key transcription factor involved in the regulation of insulin gene expression that is expressed at high levels in the β-cells of the pancreatic islets . Pdx1 and its critical roles in pancreatic development and maintenance of beta cell function , the promotion of beta-cell regeneration , prevention of beta-cell apoptosis , and reprogramming of non-pancreatic cells to become insulin-producing cells . ChgA is highly expressed in human pancreatic cells, and the human form of WE14 peptide has a sequence that is nearly identical to that of the mouse form . Furthermore, the similarity between I-Ag7 and the human HLA-DQ alleles associated with type 1 diabetes  in the binding and presentation of peptides suggests that WE14 may be presented by MHC class II molecules in humans susceptible to type 1 diabetes. This idea is worth pursuing. Many immune cells such as T cells, B cells, NK cells, APCs and other innate immune cells participate in the damage of pancreatic β cells, which eventually lead to T1DM . CD8+ T cell-mediated β-cell killing is a major mechanism of β-cell destruction . The key factors that can lead to β-cell death are cytotoxic CD8+ lymphocytes secreting perforin, cytokines IFN-c, TNF-a, IL-1b, Fas–Fas-L interactions and nitric oxide synthesis . Furthermore, in the majority of T1DM patients, there was a specific defect in CD8+ T cell recognition of HLA-E/Hsp60sp, which was associated with failure of self/non-self-discrimination . In addition, other study revealed that CD8+ T cell were found in insulitic lesions in NOD mice and in human, and can destroy β-cells upon activation via MHC class I expressed on pancreatic β-cells . CD4+ T cells can be classify into type 1 T helper (Th1), Th2, Th17, regulatory T cells (T-regs) and so on according to their secretion of cytokines. Th1 cytokines are generally believed to exacerbate, while Th2 cytokines protect from T1DM . However, many studies indicated that both Th1 and Th2 cytokines appear to cooperate in driving β-islet-cell destruction, eventually leading to hyperglycaemia . Th17 are a subset of T helper cells producing IL-17. Increased production of IL-17 by peripheral blood T cells has been detected in children with T1DM . Many studies on NOD mice have establish that CD4+ T cells act primarily through activating these cells , and that preventing their entry into the islets protects from diabetes . In animal studies, macrophages could play a pathogenic role on β-cells through their production of proinflammatory cytokines TNF-α and IL-1β . In addition, macrophages are required to the activation of cytotoxic T cells that can destroy pancreatic β-cells . Dendritic cells (DCs) are important antigen presenting cells (APCs) that are instrumental to the initiation and prolongation of T1DM. Observations in T1DM patients suggested dysregulation in the T cell response to antigen presentation by DCs . DCs play a major role in T-regs control, which able to induce potent proliferation of T-regs in the absence of exogenous IL-2 down-regulate their suppressive activity in vitro . Cytokines secreted by DCs are considered as critical mediators of the T1DM as well both IFN-α and IFN-β are secreted in large amounts by plasmacytoid dendritic cells in autoimmune diseases. Expression of interferons was elevated in the pancreas of diagnosed T1DM patients . IL-1 can also acts on T lymphocyte regulation  IL‑1 signaling has roles in β‑cell dysfunction and destruction via the NF-jB and mitogen-activated-protein- kinase pathways, leading to endoplasmic reticulum and mitochondrial stress and eventually activating the apoptotic machinery . Regulatory T cells (Treg cells) play a key role in controlling the pathogenic autoimmune process in T1DM . Tregs are suppressors of antigen-activated immune responses to self and non-self-antigens . In T1DM patients, it was stated that there was increased apoptosis, and consequently, reduced viability and function of the T-regs . In addition, injecting islet-specific Treg cells can reverse established diabetes in NOD mice . Interleukin 2 (IL-2), a cytokine which promotes Treg cell survival and function, may thus have therapeutic ability in T1DM . NK cells are potentially involved in onset of T1DM, given their ability to kill target cells and to interact with APC and T cells. NK cells are a major source of IFN-γ which consider, a key proinflammatory cytokine . The previous studies have shown a reduction in the occurrence of NK cells in patients with T1DM, and a reduced surface expression of the activating receptors NKp30 and NKp46 as well as lower mRNA levels of IFN-c and perforin in NK cells of patients with long-standing T1DM . In addition, animal studies showed that, proliferating and activated NK cells were detected only in the early prediabetic infiltrates . Most pancreatic NK cells of NOD mice became hyporesponsive at the later stages of T1DM, as reflected by diminished cytokine secretion, and reduce capacity to degranulate in response to antibodies specific for activating receptors . In this review, we have summarized current molecular and immunological mechanisms involved in developing of type 1 diabetes mellitus. Among the molecules mechanisms contribute to the risk of T1DM, HLA gene, human insulin gene (INS), cytotoxic T-lymphocyte-associated protein 4 (CTLA4), and PTPN22. The immunological mechanisms contribute β-cells death, autoantigens which include insulin, glutamic acid decarboxylase (GAD), islet cell antigen-2n (IA-2) and zinc transporter 8 (ZnT8). Also, many immune cells such as T cells, B cells, NK cells, APCs and other innate immune cells participate in the damage of pancreatic β cells, which ultimately lead to T1DM. Noble JA and Valdes AM. Genetics of the HLA region in the prediction of type 1 diabetes. Current Diabetes Reports. 2011;11:533. Xie Z, et al. Molecular Mechanisms in Autoimmune Type 1 Diabetes: a Critical Review. Clinic Rev AllergImmunol. 2014;47:174–192. Szablewski L. Role of immune system in type 1 diabetes mellitus pathogenesis. IntImmunopharmacol. 2014;22:182–191. Singal DP and Blajchman MA. Histocompatibility (HL-A) antigens, lymphocytotoxicantibodies and tissue antibodies in patients with diabetes mellitus. Diabetes. 1973;22:429–432. Eisenbarth GS and Gottlieb PA. Autoimmune polyendocrine syndromes. N Engl J Med. 2004;350:2068-2079. Caillat-Zucman S, et al. Age-dependent HLA genetic heterogeneity of type 1 insulin-dependent diabetes mellitus. J Clin Invest. 1992;60:2242-2250. Noble JA and Erlich HA. Genetics of type 1 diabetes. Cold Spring Harbor Perspectives in Medicine. 2012;2:a007732. CernaM. Genetics of autoimmune diabetes mellitus. Wiener MedizinischeWochenschrift. 2008;158:2. Pugliese A. The Insulin Gene in Type 1 Diabetes. IUBMB Life. 2005;57:463–468. Bell GI, et al. Sequence of the human insulin gene. Nature. 1980;284:26-32. Van Belle TL, et al. Type 1 diabetes: etiology, immunology, and therapeutic strategies. Physiol Rev. 2011;91:79-118. Durinovic-Bello I, et al. Insulin gene VNTR genotype associates with frequency and phenotype of the autoimmune response to proinsulin. Genes Immun. 2010;11:188–193. Bennett ST, et al. Susceptibility to human type 1 diabetes at IDDM2 is determined by tandem repeat variation at the insulin gene minisatellite locus. Nat Genet. 1995;9:284–292. Vafiadis P, et al. Insulin expression in human thymus is modulated by INS VNTR alleles at the IDDM2 locus. Nat Genet. 1997;15:289-292. Brunet JF, et al. A new member of the immunoglobulin superfamily--CTLA-4. Nature. 1987;328:267-270. Vaidya B and Pearce S. The emerging role of the CTLA-4 gene in autoimmune endocrinopathies. Eur J Endocrinol. 2004;150:619–626. Ueda H,et al. Association of the T-cell regulatory gene CTLA4 with susceptibility to autoimmune disease. Nature. 2003;423:6939. Santiago JL, et al. Susceptibility to type 1 diabetes conferred by the PTPN22 C1858T polymorphism in the Spanish population. Medical Genetics. 2007;8:54. Gregersen PK and Behrens TW. Genetics of autoimmune diseases—disorders of immune homeostasis. Nat Rev Genet. 2006;7:917–928. VellaA,et al. Localization of a type 1 diabetes locus in the IL2RA/CD25 region by use of tag single-nucleotide polymorphisms. Am J Hum Genet. 2005;76:773-779. Lowe CE, et al. Large-scale genetic fine mapping and genotype-phenotype associations implicate polymorphism in the IL2RA region in type 1 diabetes. Nat Genet. 2007;39:1074-1082. Espino-PaisanL, et al. An insight into the genetics of type 1 Diabetes. Inmunología. 2009;28:173-181. Davies JL,et al. Saturation multipoint linkage mapping of chromosome 6q in type 1 diabetes. Hum Mol Genet. 1996;5:1071-1074. ShahsavarF, et al. Small ubiquitin-like modifier 4 M55V polymorphism is not associated with diabetic nephropathy in Iranian type 2 diabetes patients. Indian J Hum Genet. 2013;19:179-182. Guo D, et al. A functional variant of SUMO4, a new I kappa B alpha modifier, is associated with type 1 diabetes. Nat Genet. 2004;36:837-841. Fung EY, et al. Analysis of 17 autoimmune disease-associated variants in type 1 diabetes identifies 6q23/TNFAIP3 as a susceptibility locus. Genes Immun. 2009;10:188-191. Caamano J and Hunter CA. NF-kappaB family of transcription factors: central regulators of innate and adaptive immune functions. ClinMicrobiol Rev. 2002;15:414–429. Lee HS, et al. STAT4 polymorphism is associated with early-onset type 1 diabetes, but not with late-onset type 1 diabetes. Ann N Y Acad Sci. 2008;1150:93–98. Frucht DM, et al. Stat4 is expressed in activated peripheral blood monocytes, dendritic cells, and macrophages at sites of Th1-mediated inflammation. J Immunol. 2000;164:4659-4664. Lee HS, et al. STAT4 polymorphism is associated with early-onset type 1 diabetes, but not with late-onset type 1 diabetes. Ann N Y Acad Sci. 2008;1150:93-98. Winkler C, et al. An interferon-induced helicase (IFIH1) gene polymorphism associates with different rates of progression from autoimmunity to type 1 diabetes. Diabetes. 2011;60:685-690.
vonHerrathM. Diabetes: a virus-gene collaboration. Nature. 2009;459:518–519. NejentsevS, et al. Rare variants of IFIH1, a gene implicated in antiviral response diabetes. Science. 2009;324:387–389. Atkinson MA and Eisenbarth GS. Type I diabetes: new perspectives on disease pathogenesis and treatment. Lancet. 2001;358:221–229. Wenzlau JM,et al. The cation efflux transporter ZnT8 (Slc30A8) is a major autoantigen in human type 1 diabetes. ProcNatlAcad Sci. 2007;104:17040-17045. Nakayama M, et al. Prime role for an insulin epitope in the development of type 1 diabetes in NOD mice. Nature. 2005;435:220-223. Ziegler AG, et al. Autoantibody appearance and risk for development of childhood diabetes in offspring of parents with type 1 diabetes: the 2-year analysis of the German BABYDIAB Study. Diabetes. 1999;48:460-468. Yu LP, et al. Early expression of antiinsulin autoantibodies of humans and the NOD mouse: evidence for early determination of subsequent diabetes. ProcNatlAcad Sci. 2000;97:1701-1706. French MB, et al. Ransgenic expression of mouse proinsulin II prevents diabetes in nonobese diabetic mice. Diabetes. 1997;46:34-39. Kent SC,et al. Expanded T cells from pancreatic lymph nodes of type 1 diabetic subjects recognize an insulin epitope. Nature. 2005;435:224-228. Harrison LC, et al. Antigen-based vaccination and prevention of type 1 diabetes. CurrDiab Rep. 2013;13:616-263. LudvigssonJ. Therapy with GAD in diabetes. Diabetes Metab Res. 2009;25:307–315. SolimenaM, et al. Association of GAD-65, but not of GAD-67, with the Golgi complex of transfected Chinese hamster ovary cells mediated by the N-terminal region. ProcNatlAcad Sci. 1993;90:3073-3077. Yoon J-W and Jun H-S. Autoimmune Destruction of Pancreatic b Cells. Am J Therap. 2005;12:580–591. Hagopian WA, et al. Autoantibodies in IDDM primarily recognize the 65,000-M(r) rather than the 67,000-M(r) isoform of glutamic acid decarboxylase. Diabetes. 1993;42:631-636. Velloso LA, et al. Demonstration of GAD-65 as the main immunogenic isoform of glutamate decarboxylase in type 1 diabetes and determination of autoantibodies using a radioligand produced by eukaryotic expression. J Clin Invest. 1993;91:2084-2090. Leslie R, et al. Antoantigens IA-2 and GAD in type I (insulindependent) diabetes. Diabetologia. 1999;42:3–14. SkarstrandH, et al. Antigenicity and epitope specificity of ZnT8 autoantibodies in type 1 diabetes. Scand J Immunol. 2013;77:21–29. Li M, et al. Advances in the cellular immunological pathogenesis of type 1 diabetes. J Cell Mol Med. 2014;18:749-758. Hassan GA, et al. Role of immune system modulation in prevention of type 1 diabetes mellitus. Indian J EndocrinolMetab. 2012;16:904-909. Barral AM, et al. SOCS-1 protects from virally-induced CD8 T cell mediated type 1 diabetes. J Autoimmun. 2006;27:166-173. Jiang H, et al. HLA-E-restricted regulatory CD8(+) T cells are involved in development and control of human autoimmune type 1 diabetes. J Clin Invest. 2010;120:3641-3650. Van Belle TL,et al. Type 1 diabetes: etiology, immunology and therapeutic strategies. Physiol Rev. 2011;91:79–118. Azar ST, et al. Type I (insulin-dependent) diabetes is a Th1- and Th2-mediated autoimmune disease. ClinDiagn Lab Immunol. 1999;6:306-310. Honkanen J, et al. IL-17 immunity in human type 1 diabetes. J Immunol. 2010;185:1959-1967. Calderon B, et al. In CD4+ T-Cell-Induced Diabetes, Macrophages Are the Final Effector Cells that Mediate Islet β-Cell Killing: Studies from an Acute Model. Am J Pathol. 2006;169:2137–2147. Hutchings P, et al. Transfer of diabetes in mice prevented by blockade of adhesion-promoting receptor on macrophages. Nature. 1990;348:639-642. DahlenE, et al. Dendritic cells and macrophages are the first andmajor producers of TNF-alpha in pancreatic islets in the nonobese diabetic mouse. J Immunol. 1998;160:3585–3593. Jun HS, et al. The role of macrophages in T cell-mediated autoimmune diabetes in nonobese diabetic mice. J Exp Med. 1999;189:347–358. GautreauL, et al. Modulation of regulatory T cell-Th17 balance by plasmacytoiddendritic cells. J Leukoc Biol. 2011;90:521-527. Tisch R and Wang B. Role of plasmacytoid dendritic cells in type 1 diabetes: friend or foe?. Diabetes. 2009;58:12–13. Mandrup-PoulsenT, et al. Blockade of interleukin 1 in type 1 diabetes. Nat Rev Endocrinol. 2010;6:158–166. Grinberg-Bleyer Y, et al. IL-2 reverses established type 1 diabetes in NOD mice by a local effect on pancreatic regulatory T cells. J Exp Med. 2010;207:1871-1878. Kilshaw PJ, et al. Suppressor T-cells in mice made unresponsive to skin allografts. Nature. 1975;255:489–791. GlisicS, et al. Inducible regulatory T cells (iTregs) from recent-onset type 1 diabetes subjects show increased in vitro suppression and higher ITCH levels compared with controls. Cell Tissue Res. 2010;339:585-595. Tang Q, et al. In vitro expanded antigen-specific regulatory T cells suppress autoimmune diabetes. J Exp Med. 2004;199:1455–1465. RodackiM, et al. Altered natural killer cells in type 1 diabetic patients. Diabetes. 2007;56:177-185. RodackiM, et al. NK cells and type 1 diabetes. ClinDevImmunol. 2006;13:101–107. BraunerH,et al. Distinct phenotype and function of NK cells in the pancreas of nonobese diabetic mice. J Immunol. 2010;184:2272-2280. Shi F-D, et al. Organ specific features of natural killer cells. Nat Rev Immunol. 2010;11:657–671.